The world is "basically at odds with itself," International Organisation for Migration (IOM) Director General William Swing said Monday, June 25, describing the critical state of human migration between countries and continents. “The U.N. Committee on Enforced Disappearances is not a court, and I say this to avoid any misunderstanding,” German expert Rainer Huhle said while presenting the committee’s recommendations to the government of Mexico, where the problem has reached epidemic proportions. As it turns 50, the United Nations Conference on Trade and Development (UNCTAD) finds itself engaged in an ongoing struggle to reduce economic and social inequalities in the world. The bloody events that marked the end of Sri Lanka’s civil war between government and Tamil separatist forces will be the focus of an independent international investigation, according to a United Nations Human Rights Council decision. Brazilian diplomat Roberto Carvalho de Azevêdo was named the new director general of the WTO with broad support from the developing world, beating out his Mexican rival Herminio Blanco, who was backed by the industrialised nations. WTO, Dubious Prize for a Latin American? The complicated challenge of invigorating the debilitated World Trade Organisation (WTO) and the multilateral trade system that it governs will fall, for the next four years and for the first time ever, to a Latin American. 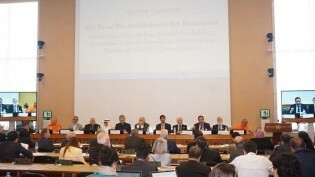 The international community has adopted a binding treaty for reducing emissions of mercury, a poisonous heavy metal that harms human health and the ecosystems on which life depends. The impact of human rights education, a rising star, is highlighted in a short documentary sponsored by United Nations experts and civil society. An expert body of the United Nations has warned the Spanish government that the severe budget cutbacks it is applying must not undermine its commitment to upholding the economic, social and cultural rights of the country's people. Profound discord between industrialised nations and developing countries is threatening to ruin the UNCTAD meeting being held this week in Doha, and may even endanger the survival of this United Nations body that defends the interests of the developing nations of the South. The reason the United Nations Conference on Trade and Development (UNCTAD) is under attack is that rich countries do not want an organisation that carries out independent analysis, Rubens Ricupero, UNCTAD secretary general from 1995 to 2004, told IPS. Social unrest and demands for change are not a negative thing during times of crisis like today, says Rubens Ricupero, a prominent Brazilian diplomat and intellectual.